Place the ribs, garlic and 1 of the chillies in a large saucepan, cover with cold water and bring to the boil. Reduce heat to low, cover and cook for 1 hour or until ribs are tender. Remove the ribs and place on a large oven tray, discarding the cooking liquid. Preheat oven to 220°C. Place the tomato puree, Worcestershire sauce, mustard, vinegar, golden syrup, salt, pepper, water and remaining chilli in a medium saucepan over medium heat. Bring to a simmer and cook for 10 minutes. Reserve ¼ cup (60ml) of the marinade. Pour the remaining marinade over the ribs, cover with aluminium foil and cook for 20 minutes. Remove the foil and cook for a further 10–15 minutes or until dark golden brown and sticky. Serve with the reserved marinade. Serves 4. + Boiling the ribs before roasting them ensures they are nice and tender. You can boil them the day before and refrigerate until ready to cook. 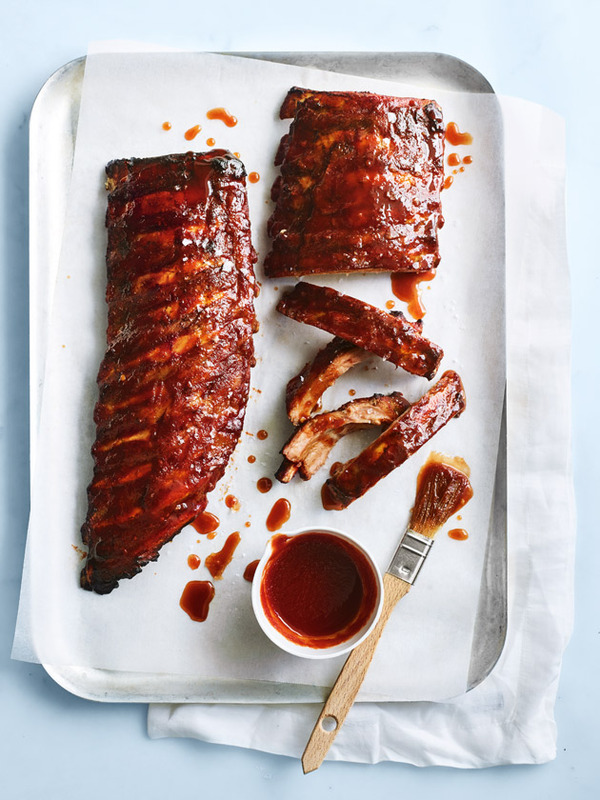 + To add a smoky flavour to your ribs, add ½ teaspoon of smoked paprika powder to the marinade.